Oh man, oh man. April is busy. I would like to sit down and not move for six hours. I really like sitting. 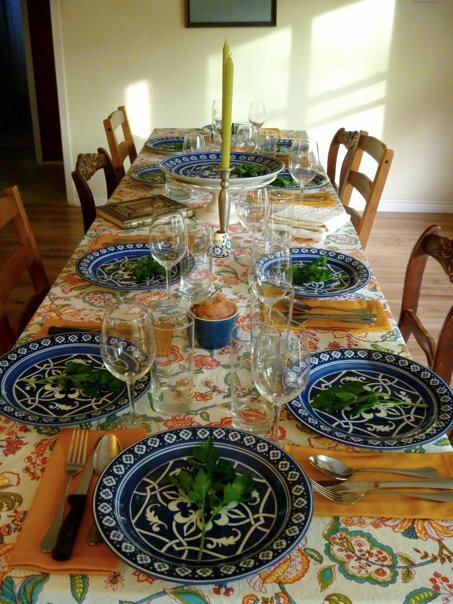 Feast your eyes on our Passover table! We celebrated late, but had an absolutely wonderful Seder. I was particularly pleased with how my brisket turned out (braised with rhubarb and honey from the All About Braising cookbook). I’ll share that recipe with you guys later because it’s feeling more and more summery here, and you’re probably not in the mood to braise five pounds of beef for three-and-a-half hours. 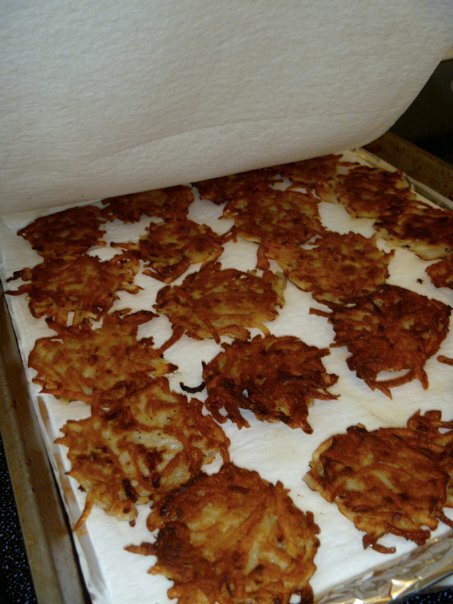 What I do want to share are my favorite latke and applesauce recipes. Do you have a food mill? You need one to make pink applesauce. And don’t you want to make pink applesauce? It’s oh so pretty. (Food mills are also totes awesome for making baby food. You can food mill anything!) Anyway, the pink applesauce is so lovely and pink because you cook the apples in their skins. Then you put the quartered apples into the food mill and zip it through, and the food mill magically keeps all the skins while spewing out the applesauce. Delicious! The key to a really crispy latke is to squeeze the water out of the grated potato and onions really thoroughly. Oh! Oh! And when you serve them, you have to have little bowls of sour cream along with the applesauce. It is impossible to eat latkes without both applesauce and sour cream. Trust me on this one. Cover, and cook over medium heat, stirring occasionally, until apples are very soft, 15 to 30 minutes. Pass apple mixture through a food mill fitted with a medium disk. Applesauce will keep, covered and refrigerated, for up to 1 week. I'm intrigued by the brisket. We tried a sweet-and-sour one this year which worked out really well. I guess I'll have to stay tuned for that! P.S. Gram really thought your table was pretty and she liked your dishes.